Permanent Makeup is a cosmetic technique which is a form of tattooing and is also known as micro-pigmentation. It is a popular well-tolerated cosmetic treatment in Toronto, involving the controlled insertion of safe colour pigments into the dermis layer of the skin. Permanent Makeup instantly improves facial appearance by enhancing eyebrows, lips, and eyelids with colour. Permanent makeup is perfect for someone who wants to save time, or has physical difficulty applying makeup regularly. It is also a great option for someone who has suffered from alopecia or has gone through chemotherapy or other conditions where hair loss has occurred. Prior to the procedure, a consultation with the client will occur; permanent makeup artist will explain the procedure and what you should and shouldn’t do prior to the procedure, go over the design, choose the right pigments, take before pictures. All of the equipment, needles, anesthetics, pigments and supplies are professional and of a medical grade. After the procedure the client will leave with the aftercare instructions and ointment to help and speed up the healing process. For better and quicker healing avoid UV lights after the permanent makeup procedure. Here are some hints on the best time to do your permanent makeup. 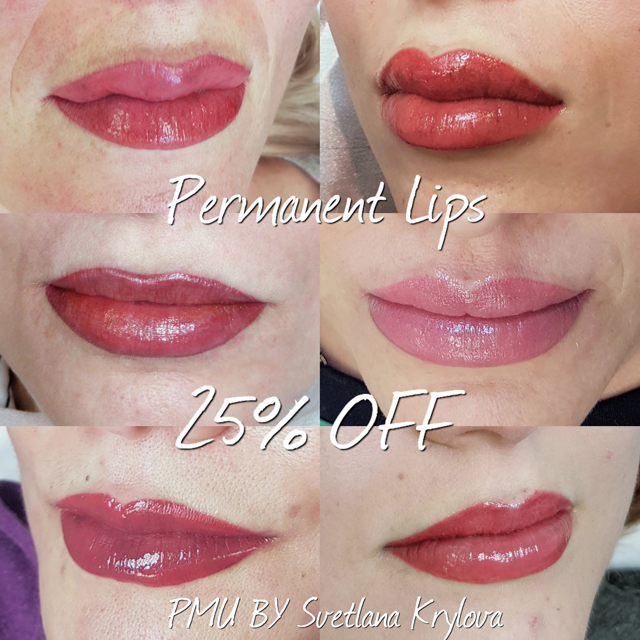 It is important to choose the right permanent makeup artist in Toronto with the appropriate techniques, equipment that will guarantee the best lasting results. Visit our permanent makeup clinic in Vaughan. We have professionally trained & certified permanent makeup experts. Book an appointment as we offer free consultations and we will provide you with the necessary information to help you make the right decision for your permanent makeup. A $100 non-refundable deposit required for any permanent makeup procedures. Does permanent makeup procedure hurt? How long is the permanent makeup procedure? Permanent makeup procedure can go anywhere from 2-3 hours. It includes a brief consultation, taking photos prior to a procedure, after drawing and post procedure, drawing, the procedure itself. We work with our client to make sure he/she is satisfied with the drawing and the pigment that we will be choosing for the procedure. Skinnovations Medical Spa wants the clients to be happy with the final results! It really depends on many factors; the skill of the artist, the healing process after the procedure, what facial treatments the client is receiving. If all is well then the client can have permanent makeup for a good few years before it starts fading. For eyebrows, we will recommend for the client to receive a touch up around 2-year mark, eyeliner and lips from anywhere 2 to 5-year mark. Yes it’s safe, if its done properly and in accordance with Public Health Guidelines. Skinnovations Medical Spa follows the Safety Standards by always making sure that equipment is disinfected and disposable items are discarded properly; gloves, needles, mask, and etc,. All supplies used for permanent makeup are for a single use only and afterwards discarded. The equipment that can’t be disinfected is covered with a plastic film to provide a barrier. One of the strict rules that we follow is to always open the packaging of the new sterile needles in front of the client prior to the procedure and at the end of the procedure to discard the needles into an approved sharp container. Our spa’s goal is to keep everything clean and professional which ensures the safety of the clients. Are there any side effect from permanent makeup? You might see some redness, swelling, scabbing within 2 to 3 days, bruising, slight bleeding which are all normal after the procedure. What you shouldn’t see after the procedure is raised pigment like blisters this could mean your client could have allergies to the pigment. Following the proper aftercare can help to avoid many side effects! How long does it takes to recover from permanent makeup? The healing process itself is around 1 month but redness and swelling should subside within 2 to 3 days and the scabs take anywhere from 5 to 10 days to fall off depending on the area that was treated. If the client is healthy and is taking good care of the treated area he/she should have no problem with a fast recovery. Is Permanent Makeup and Microblading the same thing? Microblading is a semi-permanent procedure that is performed with a blade that creates superficial incisions in your upper layer of the skin where the pigment enters. This procedure should last 1-3 years but many times about a year. Permanent Makeup (Cosmetic Tattooing) is performed with a Digital Permanent Makeup machine that uses a fine sterile needle that is up to Medical-grade standard. A needle creates microscopic punctures while depositing the pigment inside the basal layer of the skin. This procedure will last 3- 5 years before you will need to refresh the colour. Why choose Permanent Makeup over Microblading? Microblading is not for everyone and not for every skin type! If you want the pigment to last longer than microblading is not for you. Also, because of the incisions made by a blade, it can leave your skin with many scars that are hard to get rid of. For many, the pigment can heal in a cooler tone, which is not ideal if you have a warmer complexion and wanted the brows to have a brown tint instead of grey. Can I combine other procedures like Botox with permanent makeup? It is suggested for Permanent Makeup to be done prior Botox as you wouldn’t want to have raised brows with arches pulled in the wrong direction. What kind of anesthetic does Skinnovations Medical Spa uses? At the beginning of the procedure as a first step anesthetic we use topical anesthetic Zensa and for the second step anesthetic we use Tag #45. Both of these anesthetics don’t affect the colours of the pigments while providing the temporary relief that our client needs during the procedure. How to prepare yourself for Permanent Makeup procedure? Some people might think there is nothing to it but really you need to be in an overall good health as well as mentally ready for such a cosmetic change in your life. Permanent Makeup comes with some sacrifices before and during the healing stage but in the end, it’s worth it. Need a medical clearance from any blood thinners for at least 2 weeks prior and after the procedure like Aspirin, Ibuprofen, Vit. E, Glucosamine, Chondroitin, CO-Q10, Fish oil or any other medication that has blood thinners prescribed by your doctor. Stop taking Retin A (Retinol) or Accutane for at least 3 months prior to the procedure. If glaucoma is present we can’t proceed with an eyeliner procedure. If you are a past cancer survivor you will need to wait at least 6 months prior to the procedure and receive a medical clearance from the doctor. No MRI for at least 6 weeks after the permanent makeup procedure. Thinking of getting a lip procedure and are prone to cold sores? You will need to be on antiviral medication for 2 days prior and after the procedure. For an eyeliner procedure lash enhancement products should be avoided for at least 1 month prior. Any surgeries, facial procedures like laser treatments, chemical peels should be avoided for at least 1 month prior to permanent makeup. Pregnant or breastfeeding ladies should hold off until they are completely done with breastfeeding as we don’t want any discomfort. Alcohol should be avoided the night prior to the procedure. Won’t be able to give blood for a while after permanent makeup procedure. Swimming and gym will need to be put on hold until you are fully healed so keep that in mind if you will be booking any sessions. This is not a good time to plan any vacations to hot destinations. You will need at least a full month to heal prior to any excursions! Permanent makeup is not like regular makeup that comes off easily so make sure you are ready for it to be present for at least few years. What to expect after the permanent makeup procedure? You might see a bit of redness, swelling which is completely normal after a permanent makeup procedure. You might feel tight and tender in certain areas of where you had the procedure. Try to avoid anything that might cause more discomfort during your healing. You will receive an aftercare instructions with an ointment to help you during the healing process. Scabs will develop on day 2/3 and you should continue to care for them and not interfere with the natural course of healing. For best healing results DO NOT pick at your scabs or you might alter the pigment; making it uneven. What is an aftercare for permanent makeup? After your procedure you will be given the aftercare instructions with you as well as A&D ointment to aid in the healing process at home. Before leaving our spa we apply a topical antibiotic to jump-start the healing and make sure to go over the aftercare instructions together! Make sure to always wash your hands before touching your face! In fact, avoid touching your face altogether so there is less chance of getting an infection. If there is some swelling, apply ice covered by cloth to the area. First night and the following morning make sure to use Polysporin to the treated area with the sterile Q-tip. The rest of the days continue with an application of A&D ointment. Can’t use any soaps, cleansers, toners, exfoliators, makeup or any chemicals to the treated area. Splash the treated area with cool water instead and apply Polysporin or A&D ointment. After an eyeliner procedure artificial tears may be used for comfort. During the healing, exposure to the UVA/UVB rays should be avoided as well as the tanning beds, hot showers, saunas, Jacuzzis and swimming pools. Refrain from washing your hair until the 3rd day after the procedure and keep your head back to avoid water and shampoo on your face. Glycolic acids, Retinol (Vit. A), AHA’s/BHA’s, bleaching creams should be avoided before and after the procedure as it makes the skin more sensitive. Always use sunscreen to protect yourself and the pigment of your permanent makeup. Do not for any reason pick or scratch the scabs as it can lead to scarring, infection, uneven pigment on the skin and longer healing process! The scabs will take anywhere from 5 to 10 days to come off on its own. The whole healing process takes 4 to 6 weeks and towards the end, you should be able to see how the pigment stays in the skin. If correction or more colour is needed than follow up appointment is highly recommended to our clients! Will I need a touch-up? How soon can I get one? Not everyone requires a touch-up right after the first procedure. Many won’t need one until a few years later once the pigment will start fading. If the procedure was a correction of a poor permanent makeup done by another business, than the client most likely will require a touch-up. 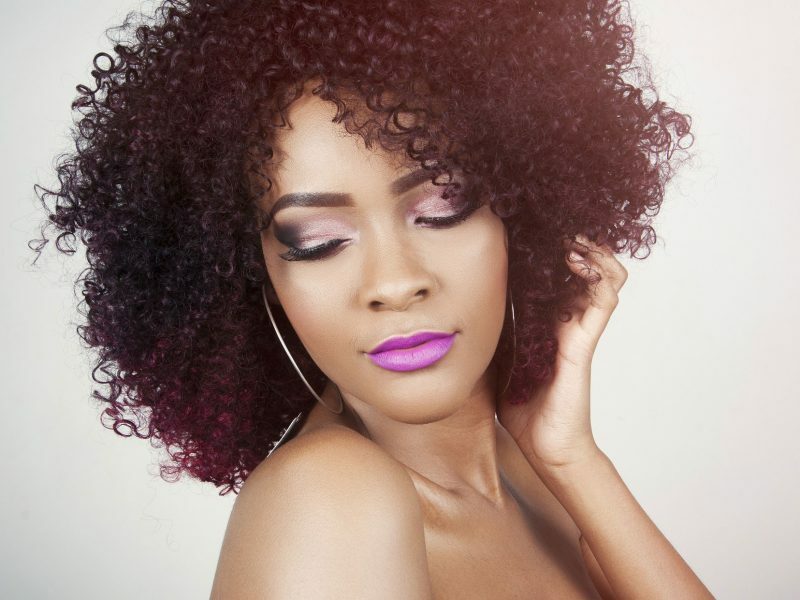 Also, if after 1 month you feel you want darker pigment or make any slight changes to what has already been done, this is the best time to do a touch-up. Make sure you take good care of yourself; your diet and your health play an important role in how quick and well you heal after the procedure. Skinnovations Medical Spa uses the best line of pigments on the market which have been tested and approved by dermatologists. These pigments that come in a variety of shades and colours are safe, hypoallergenic, don’t change colour and fade gradually over time. Pigments were made specifically for eyebrows, lips, and eyeliner. All colours have been through testing many times throughout the years! No complete tattoo removal is guaranteed but the older the tattoo, the easier it is to remove. One of the most effective and safest ways to do so is by a laser removal. The high-intensity light beam targets tattoo’s pigment by breaking down the colour, removing it in the process. Every person is different but for best results, you will need a few sessions that can be done every 4 to 6 weeks! Another method is by cryosurgery where the pigment of your tattoo is being exposed to very cold temperature by being sprayed with a freezing agent (liquid nitrogen). For this treatment, topical anesthetic is applied. Afterwards, dermabrasion is performed to help remove the top layer of the skin. This method is not the safest or effective as it can damage the skin and lead to scars. There are many home remedies that are out there but consider seeing an expert before causing any damage to your skin. Can permanent makeup cover scar? Yes, some scars can be covered but they must be smooth, flat and not a recent injury. A permanent makeup artist will need to blend some pigments to recreate the tone of the skin in order to cover the scar. Might need a few sessions for the best result! Do you shave the eyebrows before the procedure? No I would not suggest to shave your eyebrows for the procedure. In fact, it is nice to have some hair for some point reference when picking out a colour for the pigment or even creating a new shape for your brows. Is permanent makeup procedure covered by insurance? 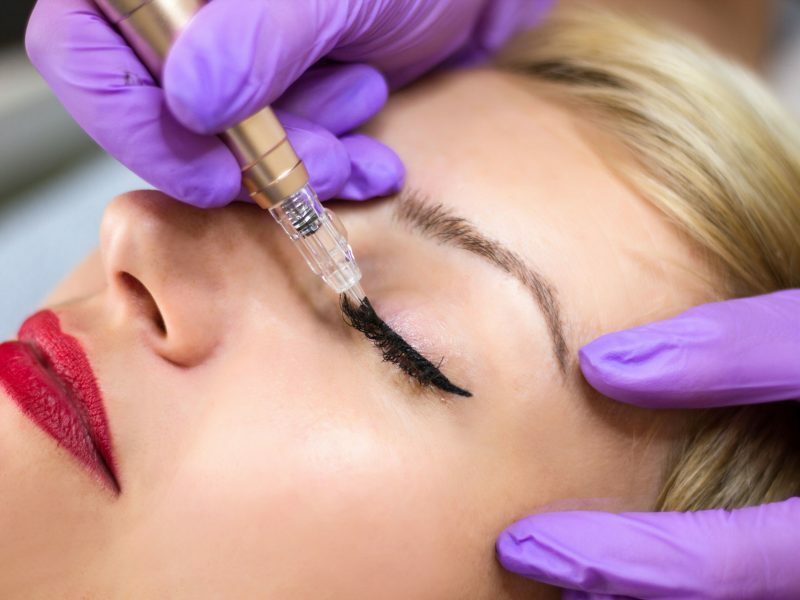 Permanent makeup is a cosmetic procedure that is not covered by insurance because it is not necessary for life but more of a desire to look a certain way.